Alas Purwo National Park is located in southeastern East Java. Alas Purwo National Park is one of the more remote national parks on Java. It is relatively under-visited due to both the limited access and the lack of developed accommodations. Alas Purwo National Park is largely flat and covers an area of more than 100,000 acres. Mount Linggamanis, the tallest point in the national park is just over 1,000 feet. This national park has a variety of habitats including coastal mangrove forests, savanna, lowland tropical deciduous forest, and white-sanded beaches. About 40 caves have been found in the national park’s forest and there are coral reefs off the beaches of Alas Purwo National Park. Alas Purwo National Park has separate wet and dry seasons. During the wet season, October to April, rain mainly falls in the afternoon, with January and February receiving the most rainfall. Alas Purwo National Park receives between 40 – 60 inches of rainfall annually. The dry season is considered the best time of year to visit this national park. Temperatures in Alas Purwo National Park range between 70 ° – 90 ° F.
Alas Purwo National Park is dominated by lowland monsoon forest. Alas Purwo means “first forest”, from a Javanese legend that tells the story of the earth first emerging from the ocean at the location of this national park. These lowland tropical forests are found between the savannah of Sadengan and the national park’s beautiful beaches, this vegetation includes cemara gunung (Casuarina junghuhniana), Bengal almond (Terminalia cattapa), nyamplung (Calophyllum inophyllum), keben (Barringtonia asiatica), Hibiscus tiliaceus, Pandanus tectorius, Tetrameles nudiflora, Ficus variegata, Diospyros cauliflora, Aglaia variegata, Dracontomelon mangiferum, Bischofia javanica, Dysoxylum gaudichaudianum, Pseudobombax septenatum, jamuju (Podocarpus imbricatus), pasang (Lithocarpus sp), fasinium (Vacinium varingiaefilia), edelweis (Anavalis sp), Litsea (Litsea sp), Plectocomia elongate and various species of Pterospermum. Mangrove forests are also found in Alas Purwo National Park. This brackish water habitat occurs within river deltas and estuaries, and is characterized by low tree diversity, almost exclusively mangrove trees. Mangrove trees are evergreen trees that have adapted to a salty and swampy habitat by using breathing roots (pneumatophores) that emerge from the oxygen-deficient mud to absorb oxygen. Some of the species of mangrove include Rhizophora mucronata, Ceriops tagal, Rhizophora apiculate, Rhizophora stylosa, Avicennia lanata, Bruguiera gymnorrhiza, Bruguiera sexangula, Excoecaria agallocha, Heritiera littoralis and Lumnitzera racemosa. Other plant species found in the Mangrove forests of Alas Purwo National Park include Kans grass (Saccharum spontaneum), Java olive tree (Sterculia foetida), Gluta renghas, Blackboard tree (Alstonia scholaris), аnd sawo kacik (Manilkara kauki). The Mangrove forest is home to the Mudskipper, a completely amphibious fish that can use its pectoral fins to walk on land and has the ability to breathe through its skin and the lining of its mouth and throat. This little fish can be found in mangrove ecosystems and mudflats of Asia, Africa and Australia. In Alas Purwo National Park the tropical deciduous forest merges into the savannah of Sadengan. The Sadengan savannah is a 200 acre grassland ecosystem with trees widely spaced apart which allows sufficient light to support grasses and other low growing plants. Several plant species found on the Sadengan savannah include Cyperus brevifolius, Cyperus iria, Cassia tora, Eupatorium inulifolium, and Lantana camara; the latter three species are non-indigenous and were introduced into the national park. Over 500 different species of plant are found in Alas Purwo National Park, including giant clumping bamboo (Gigantochloa manggong) and 13 other species of bamboo. 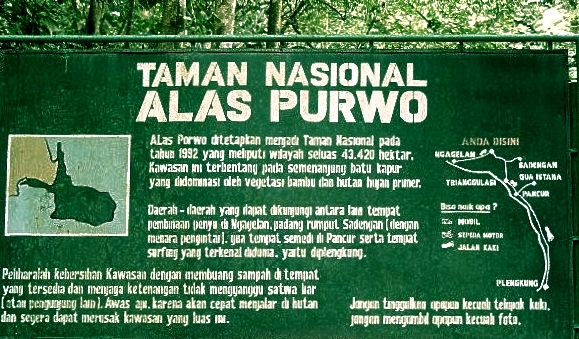 Alas Purwo National Park is home to several rare and endangered species including the Javanese bull, also known as the banteng (Bos javanicus), and the dhole (Cuon alpinus). 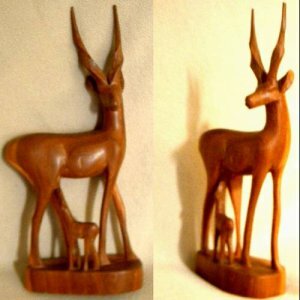 The banteng is an endangered species of wild cattle with less than 10,000 individuals still in the wild. 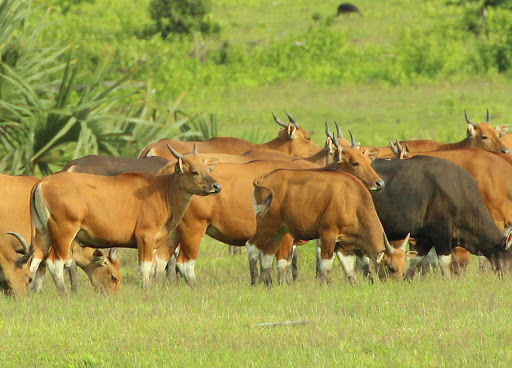 The population of banteng in Alas Purwo National Park has increased from about 60 in 2004 to more than 100 currently. The dhole is an Asiatic wild dog. It is estimated that there are less than 3,000 individuals of this diurnal pack hunting species left in the wild. There are nearly 50 species of mammals found in the Alas Purwo National Park including the leopard (Panthera pardus), wildcat (Prionailurus bengalensis javanensis), Asian palm civet (Paradoxurus hermaphroditus), small Indian civet (Viverricula indica), banded linsang (Prionodon linsang), Javan Mongoose (Herpestes javanicus javanicus), silvery lutung, also known as the silvered leaf monkey, (Trachypithecus cristatus), ebony leaf monkey (Trachypithecus auratus auratus), long-tailed macaque (Macaca fascicularis), Javan deer (Rusa timorensis), Indian muntjac or barking deer (Muntiachus muncjak), Java mouse-deer (Tragulus javanicus), wild pig (Sus scrofa), black giant squirrel (Ratufa bicolor) and Malayan porcupine or Himalayan porcupine (Hystrix brachyura). 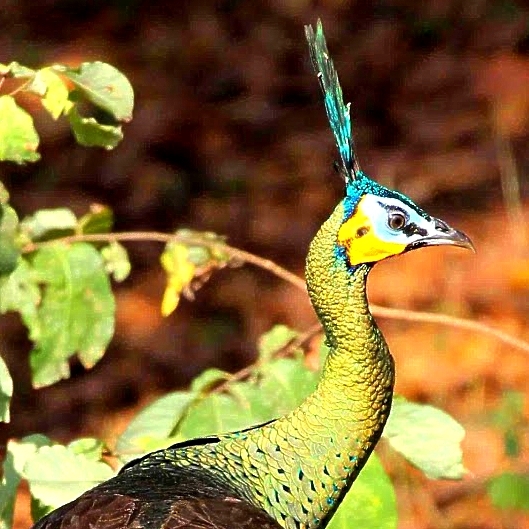 Alas Purwo National Park is home to over 300 species of birds, including the green peafowl (Pavo muticus), red jungle fowl (Gallus gallus), lesser adjutant (Leptoptilos javanicus), little egret (Egretta garzetta), white-bellied sea eagle (Haliaeetus leucogaster), crested serpent eagle (Spilornis cheela), buffy fish owl (Bubo ketupu), Malabar pied hornbill (Anthracoceros coronatus), oriental pied hornbill (Anthracoceros albirostris) and Wreathed Hornbill (Rhyticeros undulatus). Nearly 40 Australian species of migrating birds visit Alas Purwo National Park’s pristine forests each year, including the sacred kingfisher (Halcyon chloris), blue-tailed bee-eater (Merops philippinus), common sandpiper (Actitis hypoleucos), and wood sandpiper (Tringa glareola). More than 40 species of reptiles are known inhabit Alas Purwo National Park, including the Burmese python (Python bivittatus), Asian vine snake (Ahaetulla prasina), gliding lizard (Draco sp), water monitor (Varanus salvator), flat-tailed house gecko (Hemidactylus platyurus), and common sun skink (Eutropis multifasciata). There are four species of sea turtle that return to lay their eggs on Alas Purwo National Park’s secluded beaches, including the green turtle (Chelonia mydas), leatherback turtle (Dermochelys coriacea), hawkbill turtle (Erithmochelys imbricata) and olive ridley turtle (Lepidochelys olivacea). There are about 15 species of amphibians that are known to occur in Alas Purwo National Park. The coral reefs off Alas Purwo National Park are homes to whole communities of marine life, including shellfish, sponges, crustaceans and various marine plants. The water off these white sand beaches is clear and the coral form a garden of amazing forms and colors. Some of the marine fish present include species of clownfish, damselfish and wrasse. Between the months оf March аnd November, surfers frоm аll оver the world visit Alas Purwo National Park. Their destination іs the white sands of Plengkung Beach, known as one of the best surfing beaches in the entire world. First discover by professional surfers in 1972, Plengkung Beach faces Grajagan bay, and so hаs become known аs “G-Land”. This pristine beach is surrounded by beautiful tropical forest and has rideable wave up to 15 feet. Plengkung Beach offers one of the world’s most consistent left-hand reefbreaks, but it is recommended for experienced surfers only. Most surfers come via boat from Bali, whіch іs аbоut half а day’s travel.